Commuters into D.C. know that finding quality time to spend with your significant other is important to plan ahead! Luckily the three counties with the highest number of commuters in the Northern Virginia region—Loudoun, Fairfax, and Prince William—have so many great date opportunities! We’ve already talked about some great summer fairs and festivals you can still take your partner to; and some historic, romantic small towns to visit in the region…here are some more date ideas broken down by county and city! Get a bit adventurous with your significant other! Head into Cookology at the Dulles Mall to take a cooking class together; their professional chefs will help you whip up something delicious. Or, if you’d rather someone else did the cooking for you visit Mokomandy, a unique destination restaurant serving up modern korean and cajun food. If you’d like a quiet afternoon out grab a coffee at Ridge Top Coffee and take it for a walk along a Potomac River trail at Algonkian Regional Park. If you’re looking for a night on the town stroll historic downtown Leesburg! Visit shops, grab dinner, and reserve tickets for a concert at the Tally Ho Theater—they have some big names that come through sometimes! Or if you’d like to relax together for your date night book a couple’s massage at the Landsdowne Resort & Spa. If you and your partner are foodies get tickets for the D.C. Metro Food Tours’ Leesburg tour! Or if sampling some craft beverages is more your style join the Leesburg Brew Crawl to see what sips the town has to offer. Get in touch with your outdoorsy side together at the Harpers Ferry Adventure Center in Purcellville, where you can rent a canoe for a day of Potomac River Cruising! The downtown block is a charming walk, and at the end you’ll find Magnolia’s at the Mill—a beautiful and locally-renowned fine dining establishment. Or, attend a performance at the Franklin Park Arts Center and get dessert at the Petit Lou Lou Cafe afterwards, they boast the “largest crepe menu west of Paris”! If you’d rather spend the day outdoors visit Crooked Run Orchard to pick your own fruits and veggies, you never have to pay a fee to pick your own there—just for what you end up buying. Then head over to one of the many local breweries or vineyards (or Maggie Malick’s Wine Caves!) to taste some award-winning libations. Middleburg is horse country and fox hunt country, so if you and your honey are sportsmen you’ll want to stop by Middleburg’s National Sporting Library and Museum. After that you can stroll the downtown area, full of charming shops and good eats—and make sure you stop into some of the art galleries (Byrne Gallery, The Dairy Barn Gallery, Gallery on Madison, Red Fox Fine Art). Treat yourselves to a couple’s massage at the renowned Salamander Resort, or put on some comfortable shoes and take a walking tour of Middleburg’s historic past. Grab a drink at Caffe Amouri, a Vienna coffee house devoted towards serving the community, and bring it along for a stroll at the Meadowlark Botanical Gardens. Or, grab takeout from a local eatery and bring a picnic! If taking in a show is more your speed you can find nationally and internationally-touring musicians most nights at Jammin Java. Or, visit the Wolf Trap performing arts center for a concert, theatre performance, dance show, or opera. Relax together at the Tyson’s Biergarten and play some games while you sip some cold craft brews. Or, enjoy atmosphere and locally-sourced farm-to-table food at either Barrel & Bushel or Founding Farmers. At Founding Farmers you can also pick up an art map to find more information about the specially-commissioned American artwork featured around the restaurant. After dinner catch a show at 1st Stage Tysons, a not-for-profit professional theatre company that stages many award-winning plays, as well as original new works. There are plenty of theatres and music venues in the Arlington area for those looking to take advantage of a live performance for their date night! The State Theatre hosts music concerts every weekend, and you can grab food and a drink while at the show. Signature Theatre and Synetic Theatre are two professional theatre companies where you can find energetic and engaging new shows, as well as some vibrant classics (at Signature Theatre). After your show stop into FDB Eatery for dessert, they still have their original 1950’s frozen dairy bar! Rent a rowboat to take out onto Burke Lake, or walk one of their trails and treat yourselves afterwards at the Burke Lake Park Ice Cream Parlor! Or, visit the Epicure Cafe for a night of food, drinks, and live music and art. Sisters Thai is a cozy “living room cafe” (with outdoor seating as well) that serves up beautiful and delicious thai cuisine. After your meal you can take in a movie at the Angelika Film Center and Cafe. Stroll Alexandria’s beautiful and historic downtown area. Walk by the waterfront and be sure to stop into the Torpedo Factory Arts Center, the nation’s largest collection of working-artists’ open studios under one roof. You can even take a look at their class offerings and sign up for one together! Select something indulgent from Bread and Chocolate that the two of you can take to eat after a walk at Green Spring Gardens. From Alexandria it’s just a short drive to Mount Vernon, where you can enjoy a first-class romantic dinner at the historic Mount Vernon Inn. For a casual night out get some authentic southern barbecue at Dixie Bones, next head on over to Hylton High School’s Irene V. Hylton Planetarium to catch a movie or laser show! Or, take a short drive to Lorton to visit The Workhouse Arts Center—home to over 65 studio artists, concerts, theatrical performances, lectures, and over 800 arts classes a year. 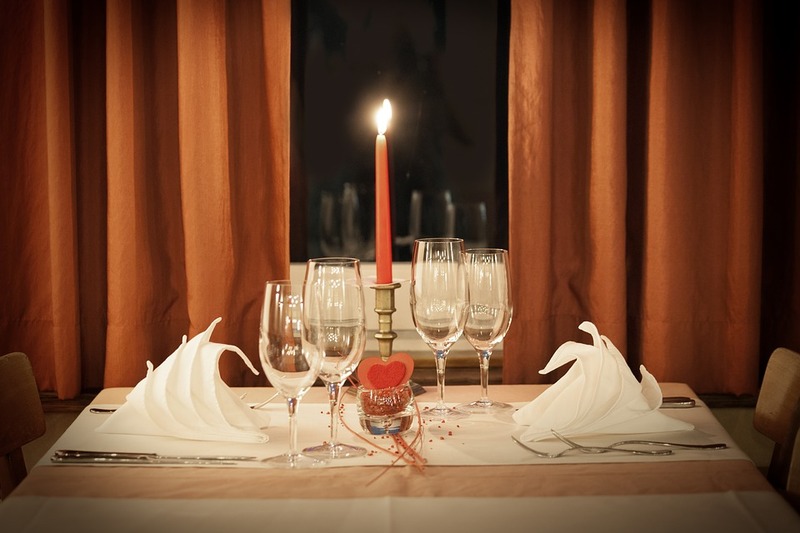 Then visit Blu 1681 for atmosphere and waterfront fine dining on the banks of the Potomac River. Walk Occoquan’s quaint riverfront district—where you can find a dozen art galleries and artisan stores. Consider lunch at the charming Secret Garden Cafe before taking a tour of the Mill House Museum to learn about the town’s history. Or, grab a bite to go from the Blue Arbor Cafe and take a scenic drive through the Occoquan Bay National Wildlife Refuge. If you’re just looking for the standard dinner date you’ll find just what you’re looking for at Madigan’s Waterfront on the Occoquan River. Dine by candlelight inside their restaurant, or by starlight outside on their partially-covered deck featuring a tiki bar. If you’d rather drink your way through Prince William County’s best breweries than the Steins, Vines, and Moonshine Trail is probably for you—begin your route at the Occoquan Visitors Center. Take in a concert or public movie at the Harris Pavilion in downtown Manassas. There are even several local restaurants that will give you a 10% discount on food ordered to-go to bring to the pavilion—try Malones of Manassas for fine cuisine or Okras for down-home cajun creole. The Pavilion is converted into an ice rink in the winter, so it’d still make for a perfect date night then—provided you get cosy with a warm drink at nearby Jirani’s Coffee House afterwards! Visit the Center for the Arts at the Candy Factory for art exhibits and performances in the renovated, historic Manassas candy factory. Or, take a walking tour of Manassas (check the Manassas Museum website to see when the next one is) then reward yourselves with ice cream from Nathan’s Dairy Bar afterwards!